I associate turquoise jewelry with my grandmother since it was the only colored jewelry I ever remember seeing her wear. My grandmother was a truly beautiful woman and bore the physical features of her proud American Indian heritage. She had several beautiful pieces and I now own the bracelet she so often wore. Beautiful and amazing turquoise is historically one of the most used gemstones in jewelry. 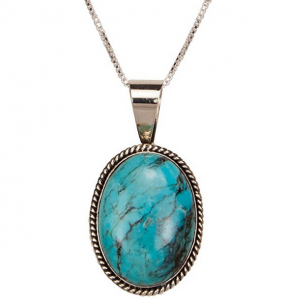 According to Native Americans, turquoise has healing powers. Also, it is a very strong stone that symbolizes protection. 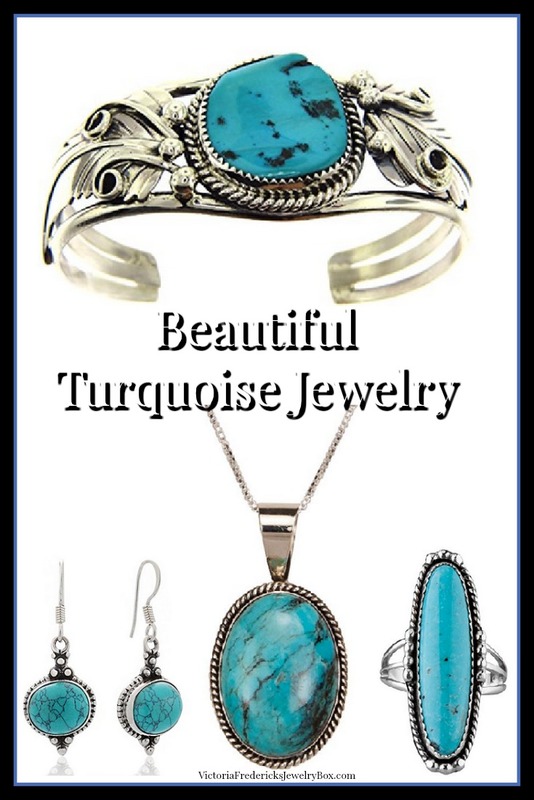 Native Americans used turquoise mainly for all their jewelry. Beautiful bracelets, earrings, necklaces and more feature the turquoise gemstone. Even though we currently associate it with Native Americans, it actually has it place of prominence further back in history. The Ancient Egyptians used turquoise for their painting and art. I grew up loving turquoise jewelry. In large part, no doubt, due to the influence of my grandmother in my life. Any turquoise jewelry reminds me of my grandmother, but some pieces more than others. The soft blue-green colors of turquoise always seemed an unlikely color to be paired with the bold and heavy jewelry settings so commonly used. However, I can assure you that my grandmothers jewelry was always beautiful. They really were the perfect accent pieces for such a strong woman in character, who had such kind ways and delicate physical features. I always admired my grandmother’s jewelry. In my case, I simply loved the blue-green color! When I was a teenager, I purchased my turquoise ring with my hard-earned babysitting money. While not really very expensive, it was a lot of money to me at the time. I adored that ring and to this day, I still have it. It is a treasured keepsake from the days of my youth. The ring on the right resembles the ring I selected so long ago. I wanted the elongated genuine gem like you see here. The setting is sterling silver just like this ring. My grandmother most often wore black. As a matter of fact, I never see a black ribbed turtleneck sweater that I don’t think of my grandmother. She was always such a beautifully elegant lady! Her turquoise bracelet was absolutely the perfect accessory for her black sweater. The black background created by the sweater perfectly showcased her beautiful bracelet. When I wear the bracelet now, I also wear it with a black ribbed turtleneck sweater. The ensemble makes me feel close to my grandmother once again. Again, the cuff bracelet on the right most resembles my grandmother’s bracelet. I have a single large stone with a beautifully ornate setting. Personally, I have always loved Turquoise earrings even though I never saw my grandmother wear earrings. I suspect they simply were not as in style with her generation, but I could easily imagine her wearing the drop or dangle style earrings. Earrings are very much a part of our current culture and I love both the post style or the hook dangle earrings. The choice to wear would depend on my destination. Generally speaking, the post is a more conservative style appropriate for day or office wear, while the drop earrings would be lovely for a dinner or evening out. We often prefer purchasing sets that have matching settings, especially if we are giving them as gifts. As with any gem, proper care will ensure a longer and more beautiful life of the stone. For turquoise, simply wipe with a soft, clean cloth dampened with warm water. A soapy warm water cloth can be used to remove excessive dirt. Never clean with steam or ultrasonic cleaners. Also, keep in mind that Turquoise can be discolored by chemicals. 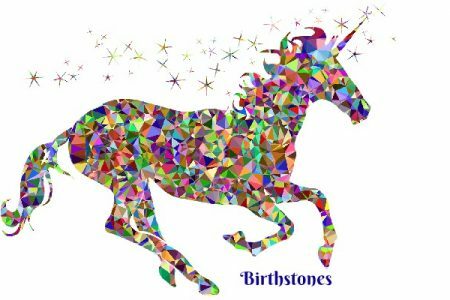 Unfortunately, disreputable suppliers will knowingly offer a piece of jewelry based on the color of stone, which does not mean it is a natural gemstone. If you want the natural gemstone and not just a colored imitation, you need to buy from a reputable store that will give you a statement of authenticity. It is very difficult to visually identify the natural gemstone since imitation is often made from natural elements. This video will give you a wealth of information if you are interested. Select Your Favorite Pieces Today!